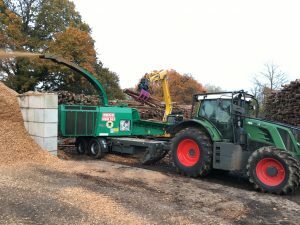 This Jenz whole tree chipper has added great precision to our wood chip production arm and provides our site clearance operations with an adaptable and agile large chipper for shorter contracts. For example, we now tow this chipper into London to carry out condensed programme site clearance works using a Low Emission Zone (LEZ) complaint tractor, which eliminates the need for a low loader to try and access a tight site. Loaded by an excavator fitted with selector grab, this machine quickly loads bins or lorries.